While most overhead lifting chains used to be made of Grade 80 material, the standard for today is Grade 100. It costs about the same as its predecessor yet carries a major benefit--it's stronger! We are an authorized dealer for GrabiQ chain and fittings from Gunnebo Johnson. 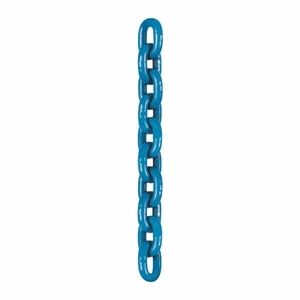 It comes in a distinctive blue finish (unique in the industry), offers 20% minimum elongation and each link is tested to 2-1/2 times the Working Load Limit. With these great safety features and a 4:1 design factor, it's the perfect choice for overhead lifting! We sell it by the foot in all the most popular sizes, and give quantity price breaks for orders over 50ft.